Ben Russell is the latest player to join the Phantoms casualty list. Phantoms’ injury troubles have continued with defenceman Ben Russell becoming the latest player added to the casualty list. 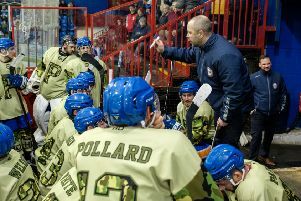 Russell, an excellent performer in his first season with the club, suffered a mild concussion in the club’s 6-1 success in Sheffield on Monday night. The 22 year-old is now unlikely to play any part in this weekend’s games - away to reigning champions Basingstoke on Saturday (6.30pm) and another home date against Sheffield on Sunday (5.30pm) - according to coach Slava Koulikov. “Ben went to the hospital on Tuesday to get checked out and he has a mild concussion,” said Koulikov. “He will take it day by day, but I don’t think it is likely that he will be playing this weekend. “We will miss him because he is one of the guys I know I can always rely on to do the right thing for the team. “He is a quiet guy who just goes about his business, and has proved to be a very good signing for us. “We’ve had a really tough time with injuries this season and we just can’t seem to get a clear run. Koulikov will be hoping Russell’s absence is brief after a season littered with injury problems. Netminder Janis Auzins, fellow defenceman Tom Stubley and forwards Marc Levers, Will Weldon, Sam Towner and the now-departed Connor Glossop have all endured lengthy absences. They are still ongoing in the cases of Levers, who has been troubled by a hernia problem since early Decemeber, and Weldon, who suffered knee damage in a Boxing Day success at fierce rivals Milton Keynes. Levers has played through the pain barrier twice in recent days with Phantoms short on numbers, but he is still awaiting a hospital appointment which is likely to lead to surgery. Koulikov added: “Marc has showed his commitment to play in a couple of games lately despite carrying an injury. “He always sets a great example to the younger guys and his injury is probably the one that has affected us most. “He was having a terrific season and is a hugely influential figure who plays a big part in our powerplay and penalty kill. There was at least one positive on the injury front when Darius Pliskauskas returned to action in both games against Sheffield on Sunday and Monday. The Lithuanian international had missed two games after suffering a back injury at Milton Keynes on Boxing Day.